THIS pretty little fern has an unusual interest to the col-lector of our native plants from the fact that it has no close relations in this country; that it has been found in but a few locations in New Jersey and not abundant in any of them; and because its discovery is of comparatively recent date, and most persons who go into New Jersey on botanical explorations are generally on the alert to discover new locations for the great rarity. The history of the discovery will afford us some lessons on the "truths " of history, and will illustrate a point we have often had occasion to dwell on in the preparation of these chapters, that authors scrupulously accurate in the description of plants, or matters which come directly under their own eyes, often exhibit great carelessness in matters no less important, but which are only incidentally associated with the plants they describe. In the Herbarium of the Lyceum of Natural History of New York, with a specimen of the Schizaa, is this label in the handwriting of Dr. Torrey: "First discovered by Dr. C.W. Eddy, near Quaker Bridge; Dr. Eddy was in company with J. Le Conte, Pursh and C. Whitlow, and though he and Mr. Le Conte found all the specimens, Pursh has claimed the honor of the discovery himself." This is signed "Torrey and Cooper, 1818." Underneath this another note signed "Cooper," which says, "First found in 1805, not found again till detected by me in company with Dr. Torrey in 1818." How improbable it is that Pursh and Eddy discovered the plant in 1805 may be seen from the fact that Eddy's aunt was the wife of Dr. Hosack, who established the New York Botanic Garden, and that Pursh went to take charge of this Botanic Garden in 1807, and in all probability made the acquaintance of Dr. Eddy, then very young, through his engagement with the uncle. Moreover, Pursh tells us in his preface that he was absent, in 1805, in the South, and in the West in 1806. Further it appears from a letter of Dr. Muhlenberg to Zaccheus Collins, dated April 28th, 1812, and preserved in the Library of Academy of Natural Sciences, of Philadelphia: "Schizaea tortuosa was discovered last year (1811) by Mr. Pursh and Dr. Eddy." Even at this time there seems to have been some wrangling as to who discovered it, for in another letter the same letter-writer, referring to a visit from C. Whitlow, says: "If all that he says in his good humor can be depended on, he found the Schizaa tortuosa at the Quaker Bridge." Even the claim of Mr. Cooper, that he and Dr. Torrey were the first to re-discover the plant, may be barely correct; for in another letter in the same collection, from Mr. Collins to Dr. Bigelow, of Boston, dated August 3d, 1818, he speaks of having been there the past season and of finding the plant, as if not knowing that any botanist had had the same good fortune before him that year. Again, Professor Eaton says the plant was found by Dr. Eddy in 1813, but as the preface to Pursh's Flora was written in London that year, this cannot be. In spite of all these varying statements it appears probable that Pursh took a trip to New Jersey with Eddy late in the autumn of 1811, after his return from the West Indies, and before sailing for Europe to prepare for his great work, and it is very likely that they both found it so nearly simultaneously that either may be justified in claiming the discovery. Some may say that these matters are of little consequence; but if a fact is worth recording at all it is worth recording accurately, and it is to impress this on the student that we have given this question so much consideration here. Dr. Caspar Wistar Eddy, whose name is so prominent in connection with the discovery of this fern, was a relative of Dr. Samuel L. Mitchell, the founder of the New York Lyceum of Natural History, of which young Eddy was one of the incorporators. He was very zealous in the cause of botany for a while, and Torrey named a genus Eddya, after him. In 1814 he began an edition of Miller's Dictionary. The next year we read of his proposing to write an elementary work on botany, "preserving the best features of the Linnaean system," but expunging all the terms that had relation to the sexes of flowers. But this seems to have been also abandoned, for soon after we find him projecting the issue of a popular colored Flora of the United States, similar to that we are now engaged in. He died soon after, still young in years. By Muhlenberg's letters it appears that it was Pursh's intention to call the newly discovered Schizaa, S. tortuosa, in allusion to its twisted fronds; but when his work was issued it was described as Schizaa pusilla, the name it now bears. This is, perhaps, in consideration of its small size in comparison with other species, of which there are over a dozen, found chiefly in tropical America, Australia, the islands in the Pacific ocean, southern Africa and the Himalaya mountains. Most of these have the peculiarity of our species in being locally distributed and not occurring to a very wide extent in any one place. Since the first discovery at Quaker Bridge, it has been found in a lew other places in New Jersey, and recently in Nova Scotia. In these spots the country is almost impenetrable from the dense vegetation clothing the swamps, and those who explore have to follow closely the track of those who have gone before. It will, no doubt, be found more abundant some day. The plant now illustrated was gathered by the author in a location discovered by Mr. Charles F. Parker on the Atsion river. 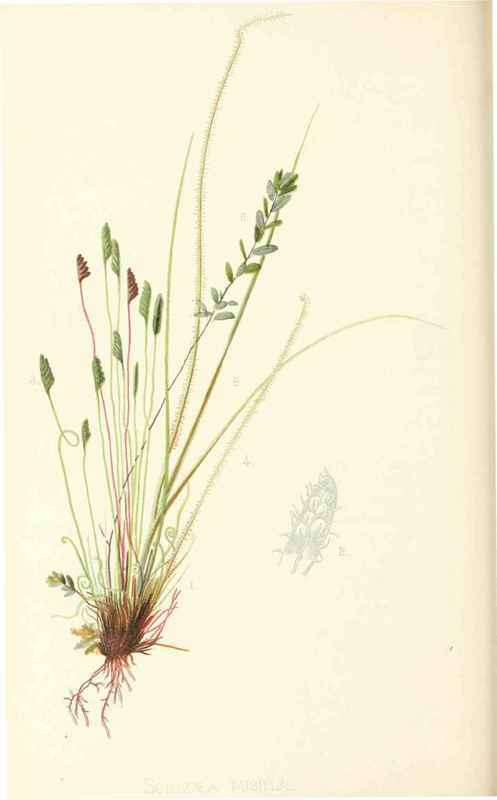 It was growing in company with Drosera filiformis, cranberries, and small sedge grasses, just as represented on the plate; and Sarracenia purpurea and many ericaceous plants were growing among the scattered oaks and Cupressus thuyoides, which shaded the whole spot. Close by was an impassable swamp. This was in the end of July, and a good time to show the commencement of maturity in the fructification, as in the enlarged drawing, Fig. 2. The structure is interesting in many respects. In many ferns the barren fronds are the largest, the fertile fronds rather contracting at fructification. Here it is reversed, the twisted threadlike lines at the base being the early barren fronds. Usually the twisting is described wholly in connection with these barren fronds, - but as we see by our plate, the fertile ones are disposed this way also. The peculiar structure of the infertile fronds was made the subject of a communication to the Academy of Natural Sciences of Philadelphia, by Dr. J. Gibbons Hunt, in the volume for 1874. He says: "The barren frond is marked on its epidermal surface with a double line of stomata, and these organs extend the entire length of the frond. The cells which make up the interior of this delicate fern are cylindrical and vary in size, but their distinctive characters lie in minute projections or outgrowths from all sides of the cells, and these projections meet and are reticulated with corresponding outgrowths from the adjoining cells, so that the cells of Schizaea have, penetrating between them in every direction, intercellular spaces and channels of remarkable regularity and beauty; and so characteristic is this plan of cell union that the botanist need find no difficulty in identifying the smallest fragment of the plant." The name Schizaa was suggested to Sir James E. Smith, who established the genus, by the manner in which the fertile frond is delicately cut and divided, from the Greek word schizo, to cut. 1. A full-sized specimen, with barren thread-like twisted fronds at the base, and fertile fronds of more or less-maturity at the top. 2. An enlarged lobe or boat-like division of the fertile frond, with sporangia or capsules just opening. 4. Leaves of Drosera filiformis. 5. Leaves of a Carex. 6. Small branch of a cranberry. 7. F onds of a moss (Hypnum).